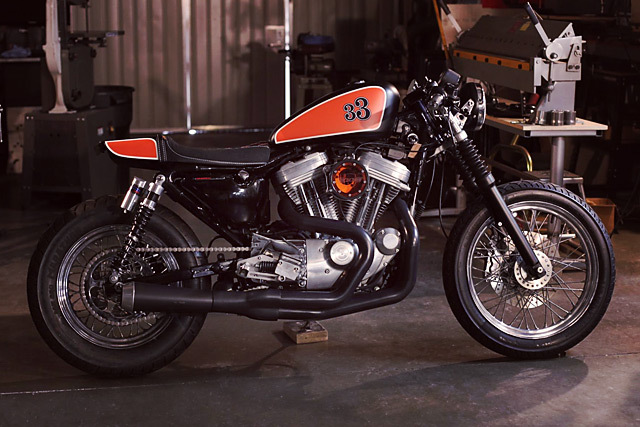 Subscribe: RSS Bringing you the world's best cafe racers, trackers, scramblers, bobbers & custom motorcycles. Chris and Rob Chappell of Chappell Customs are two brothers that have been building a variety of streetable custom motorcycles for a long time now. With Rob in Ontario and Chris in Los Angeles, they don’t build many bikes together the way they used to. But for Chris, this Harley Davidson project took on a challenge much harder than just pure geographical separation. This 1997 HD 883 was owned by L.A. based Chappell Customs worker Chris Hensley, who tinkered on the bike when he had a little spare time. Along the way head honcho Chris Chappell bought the 883 but just two days before it was completed Hensley was tragically killed in a motorcycle accident on the way to work. Following his passing the bike sat once more until Chappell did what he does best and finished the bike in a fitting tribute to his friend. When Chappell purchased the bike from Hensley the paint scheme was a very different one, but Chappell found a way to preserve the old and create his own look. The Hensley paint scheme was Root Beer coloured metallic paint with some subtle black airbrushing to make the tank really stand out. Not wanting to destroy a perfectly good paint job Chris used Orange Plasti Dip and Black trim paint to create the street racer look you now see before you. Don’t like the paint as it is and want the Root Beer metallic look? Just peel off the Plasti Dip and instantly transform the bike’s appearance. Over the past months a growing number of feature builds have been sporting Tuffside.com seats and this 883 is no different. Not surprising because TUFFSIDE is actually a division of Chappell Customs and this bike was the test mule for a new seat design. A new mould was created in a style that suited the look Chris was after and works well with the overall 883 design. The base was then fully upholstered by Chris with black tweed on the edges and perfectly stitched orange diamonds over black in the centre. 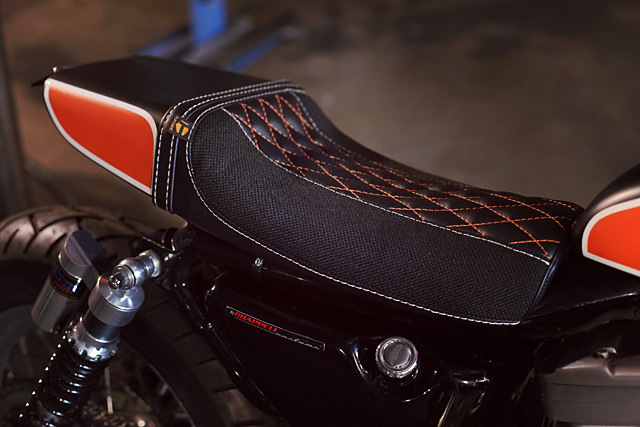 As the frame had already been trimmed a new hidden support has been added to support the new seat with a small LED tail light taking care of the functionality. One thing that is true of all Harley builds is that the engine will always be at the heart, it’s how you integrate the thumping 45° V-Twin into the design that dictates how strong a part that heart plays. 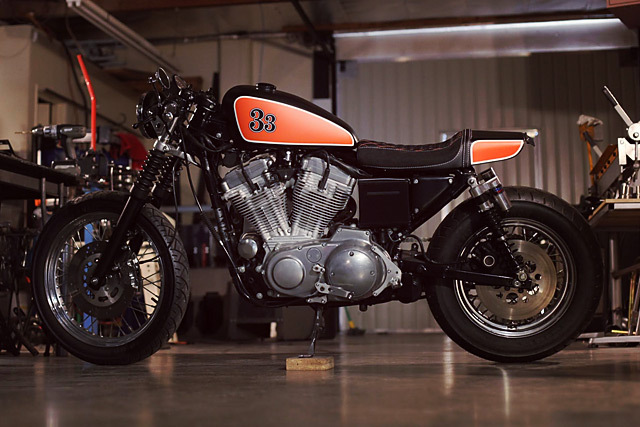 Rather than black out the 833cc of Milwaukee muscle Chris has left the low mile engine in raw metal and allowed the bolt-ons to simple accentuate what is already there. The exhaust is a Road Rage 2 into 1 setup from Bassani in black with the stock carby rejetted to suit. 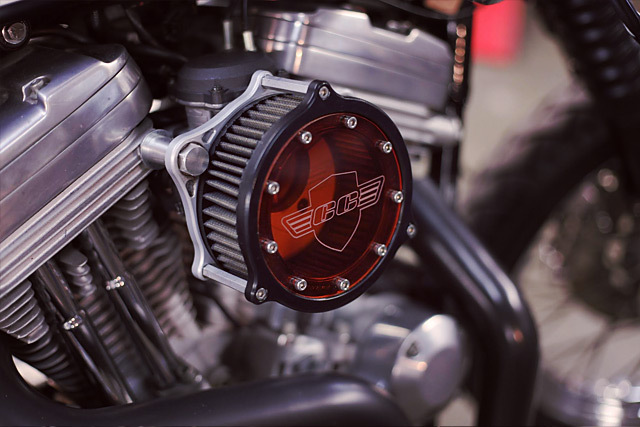 Speaking of the carb it now breathes through a Figure Machine intake that has had the stock clear cover swapped out for a custom engraved orange piece with the Chappell Customs logo. It’s hard to think of a Harley that is more fun to ride than the little sportster and Chris has made sure it is even better in the twisty stuff. The rear end has been dramatically improved with the fitment of 15inch Works Performance piggy-back shocks, while the front end features SM preload adjusters for fine tuning. With the front fender removed any fork flex is eliminated with the fitment of an RSD fork brace that looks the business too. To finish things out Chris ditched the standard belt drive and performed a chain drive conversion. With the 883 now handling far better than stock it makes no sense to skimp on rubber, so Chris picked up the increasingly popular Metzler product that is Guy Martin’s contact connection of choice. Bringing the whole show to a halt is improved braking thanks to a Performance Machine 4 piston front caliper fitted to the now blacked out front end. 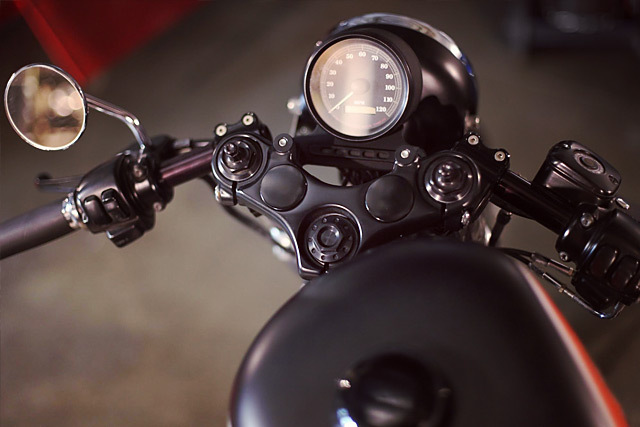 Steering duties now place the rider’s hands on RSD clip-ons with standard switches that gives the bike a tougher, lower look. To further accentuate that feel the headlight has been replaced and slightly lowered and the speedo brought down below the top line of the tank. With just 5000 original miles on the clock this would make a perfect shop bike for years to come, as Chappell says “We would love to keep this bike forever and hang it on the wall to remind us of our friend Chris” but that wasn’t ever the plan, so this Chappell Customs machine is looking for a new home and an owner who will ride it with all the passion and enthusiasm Chris Hensley would have wanted. This build has taken on more than a little extra meaning, but as always Chappell Customs delivered a bike that goes as well as it looks, leaving no area of form or function left wanting. It’s a fitting tribute to a much-loved man. Get the latest custom bikes sent to you via email as soon as we post them. 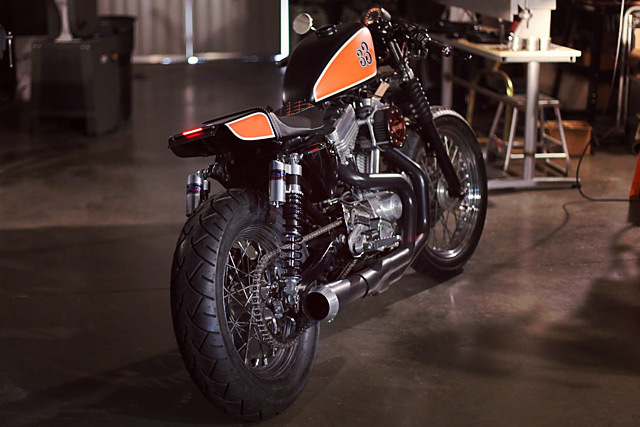 Based in Sydney, Australia, Pipeburn is a blog that searches the world to bring you the very best custom motorcycles including the latest café racers, bobbers, trackers, brats, classics and more. Owned and run by two bike-obsessed guys just like you, we aim to inspire you and maybe even get you off the couch and into the garage. We thrive on reader submissions, so feel free to contact us with any bikes, builds or interesting finds you think may be worthy. © Copyright 2009-2019, Pipeburn.com. All rights reserved.